To more effectively share the Gospel in our community, three confessional Lutheran congregations in the Pipestone, Minnesota area formed a tri-parish and called the Rev. Robert E. Moeller, Jr. to serve as their pastor. St. John’s Lutheran Church in Trosky, Trinity Lutheran Church in Jasper, and Our Saviour’s Lutheran Church in Pipestone, congregations of the Lutheran Church-Missouri Synod (LCMS) held a joint Divine Service and Installation on Sunday, October 15, 2017. The name “Three Strands” comes from a passage in Ecclesiastes, where Solomon writes of the value of companionship, friendship, and partnership: “Two are better than one, because they have a good return for their work: If one falls down, his friend can help him up. But pity the man who falls and has no one to help him up! Also, if two lie down together, they will keep warm. But how can one keep warm alone? Though one may be overpowered, two can defend themselves. 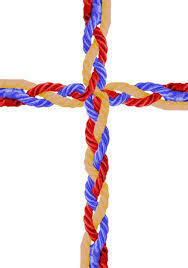 A cord of three strands is not quickly broken” (Ecclesiastes 4:9–12, NIV84). This image of a braided rope is very fitting for our parish. The three congregations working together are much stronger than any one of them would be individually or even two of them would be by themselves. Working together we will be able to accomplish much more than separately as we reach out to the people of our community with the love of God in Christ Jesus.